The number of Vietnamese studying at all levels in Canada skyrocketed to 46 percent from a year ago to 20,330 in 2018. This means that it has overtaken the U.S. to exclusively occupy the fifth spot as a source market for international education in Canada. In reporting this information, the Canadian Bureau for International Education cited figures released last month by Immigration Refugees and Citizenship Canada, a government agency. Vietnam and the U.S. had shared the fifth spot in the list of countries and territories sending students for overseas study in Canada in 2017, but the latter slipped one place to sixth globally last year, with just 14,620 student enrolments. According to the report, the number of Vietnamese students in Canada rose fastest among foreign peers and now accounts for 3.55 percent of total international students in the country. The top five is led by India (30.16 percent), followed by China (24.98 percent), South Korea (4.23 percent) and France (3.97 percent). The other countries making the top 10 list are the U.S., Brazil, Nigeria, Iran and Japan. At the end of 2018, Canada reported more than 572,000 international students holding study permits, up 16 percent from a year ago, putting it the world’s third-leading host of Vietnamese students after Japan and the U.S. In recent years, Canada, which is often viewed as a safe haven compared to the U.S. where crime and violence is still at the ‘red’ alarm level, has emerged as the hot overseas study destination for many foreign students, including those from Vietnam thanks to a “comparatively open” immigration policy, experts said. “The Canadian government is doing everything right. It recognizes the pressing need for well-educated and highly trained immigrants and its immigration policy reflects that priority,” said Mark Ashwill, an American educator who runs Capstone Vietnam, a full-service educational consulting company with offices in Hanoi and Ho Chi Minh City. 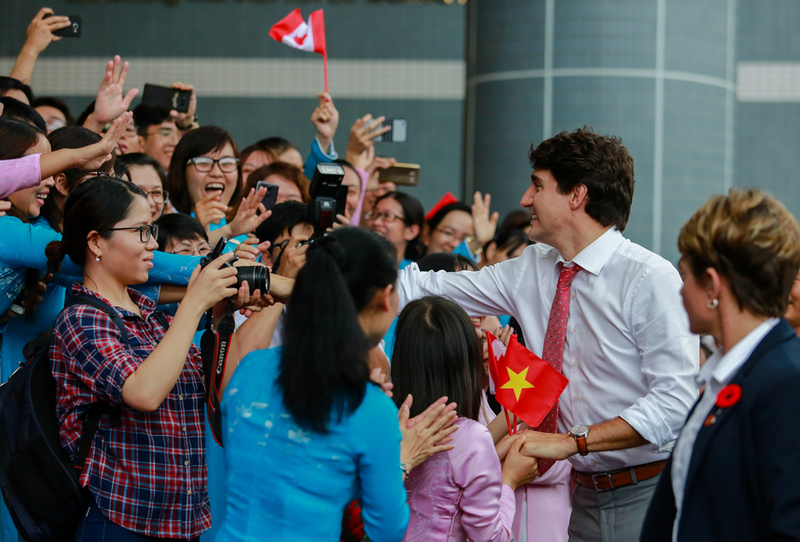 He also highlighted the possibility that Canada will soon surpass the U.S. in terms of the number of Vietnamese students within its borders in the next few years, as Canada now has 68 percent of the number of Vietnamese students in the U.S. According to a report published last year by the U.S.-based Institute of International Education, there were 24,325 Vietnamese students attending American colleges and universities in the 2017-2018 academic year. Ashwill backed his prediction by noting that the number of Vietnamese students in the U.S. is declining, as indicated by the number of visas issued by the U.S. government in the first three months of 2019. “What’s clear is that Canada is no longer a second-choice destination for those who were unable to obtain a U.S. student visa. It is quickly coming of age as one of the most desired places to study for over hundreds of thousands of international students, with Vietnam leading the way, at least in terms of recent percentage increases,” Ashwill said. The application process to obtain Canadian study permit is much more straightforward, predictable and fairer than that of the American student visa, he added. Vietnamese parents place great importance on their child’s education with spending on education accounting for nearly a half (47 percent) of the total household expenditure, according to Vietnam’s education ministry. In their efforts to improve the quality of education for their child, more and more parents are considering sending them abroad to study. Vietnamese families are spending as much as $3-4 billion each year on sending their children abroad to study, Minister of Education and Training Phung Xuan Nha told the National Assembly session in Hanoi last year.